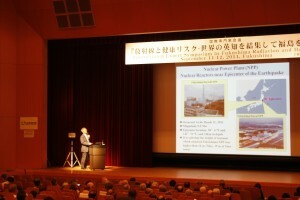 In order to reduce the risk of thyroid cancer, immediate distribution of iodine tablets to the residents near the nuclear power plants is one of conventional means after nuclear accidents for preventing uptake of radioiodine. However, Japanese government did not issue the order of the distribution at all. Only some municipalities distributed iodine tables by their own decision. Many things have been said about the health condition of the children who had been exposed to radiation in Fukushima prefecture, which is extensively contaminated. Some say that the same thing like Chernobyl won’t happen in Fukushima since the situation is completely different. A lot of parents want to believe so even though there is no evidence to confirm it. When the Chernobyl accident occurred, in addition to the level of soil contamination, the reference value of forced migration was more than 5 mSv per year. The Japanese government set the reference value of 20 mSv per year to specify the evacuation zone. This was conveyed in the context which tells that up to the effective dose of 20 mSv per year is safe. However, many epidemiological studies pointed out that there is also a possibility of having cancer and other diseases in low-dose radiation area whose level is less than 100 mSv per year. There is no text book to tell us about the effect of that like the case of Chernobyl. Long-term effects of low dose exposure are still unknown. Of course, Japanese government also took some measures against this situation. They implemented such as whole-body counter check-up to measure the internal exposure, the survey on health care to the residents, the thyroid testing for the children under the age of 18, and estimates of external dose records since immediately after the nuclear accident. Currently, the medical cost for the children under the age of 18 in Fukushima prefecture is exempted. Answering rate of health management survey for the residents in Fukushima is　only about 25% though more than a year has passed. Those children whose lumps are smaller than 5 mm, and smaller than 20mm found in the thyroid testing (as of October 2012) are determined in a particular category. However, at the result explanation time, those parents were told that there was no problem and to the second test would be set 2 years later. Many parents in Fukushima prefecture want to request more frequent and free regular medical examinations for their children. However, it is impossible in this current situation and instead, they send their children to low-dose region as much as possible during long holidays like summer vacation, and try to know the extent of internal exposure by urine test.